Cisco Sponsors Rachel Maddow? Really? Cisco Systems, which has a big* video teleconference business with a product calledTelePresence, is entering the broadcast world with the MSNBC’s Rachel Maddow, who is using the system to conduct remote interviews. The Rachel Maddow Show is the first program use the Cisco system. It is also the only MSNBC program to be sponsored by Cisco. Cisco display ads and pre-rolls dominate the show’s site. We assume that the use of the conference device is part of the sponsorship arrangement. Most of you know me and my political leanings. I am not exactly what you call a fan of Rachel. I’ve heard her name for ages thanks to the shady dealings of her former (and now fully defunct, right?) employer Air America Radio. The entire organization seemed corrupt from the top down. Not paying taxes, not paying employees or the talent, stealing from charity. Even the hosts were certifiable idiots. I lived in South Florida when Rhandi Rhodes was there before AAR existed, and I can say that she was always that looney. There were a number of times when she regularly skirted the line of what is actually legal to publicly say about a sitting president. That sort of rhetoric was pretty commonplace on AAR. And then there’s MSNBC, the current employer of Maddow. If there ever was a video version of the insanity that was Air America, it is now MSNBC. I used to hold them in a somewhat of a soft spot in my heart due to their early days tech focus and association with Microsoft. Those days are long past: Keith Olberman and his made up news hour. Chris Matthews and his whatever the hell you call this sort of stuff. But I spent some time researching Rachel Maddow. I may disagree with 80% of what she says, she’s kept her nose clean as long as you don’t judge her guilty by her associations. She didn’t say any truly outrageous things at Air America like her fellow hosts. She, so far, is only guilty of favoring Hillary over Obama during the primaries at MSNBC. So her strategy, apparently, was to find the craziest bunch of poli-retards on the planet, and be the sane one by comparison, and wait until people noticed her. The basis for this post is really weak. Why go on about Randi Rhodes and then follow up by stating that Maddow is not like Randi Rhodes? (No kidding, by the way.) Then you slam Olberman and Matthews, but you say Maddow isn’t really like them either. 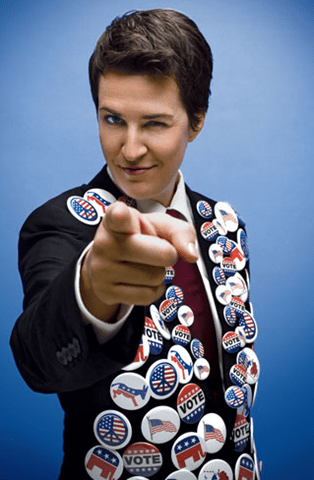 I listened to Maddow’s radio show regularly and followed her MSNBC coverage of the primaries. I found no basis whatsoever that she favored Clinton. Maddow wasn’t outwardly hostile towards Clinton like Olberman, Matthews, Shuster, et al, but to say that she favored Clinton is so uninformed that it’s laughable. I don't regularly listen to Maddow, Ashley. Perhaps I should have linked to the dozens of blog posts and editorials that accused her of favoring Hillary over Obama during the primaries, but there were so many of them I figured it was the common consensus. Honestly, in my mind, Maddow has always been guilty by association. She has, throughout her very short and, in my mind, undistinguished career, hung out with poli-nutjobs. I honestly thought, before I researched her, that she was just as looney as the rest of them. My point is that's the common consensus. That's how the rest of the non-Maddow watching public perceives her. She's that one lady that was on Air America, the radio network of angry yelling liberals, that moved to MSNBC, the TV network of angry yelling liberals. And now Cisco has associated their brand with that image we all have. In the interests of fairness, I did say that she's the relatively sane one on both of those networks, but in the broad view, how does that matter to a marketing effort if the perception is otherwise? The problem with most conservative commentators is that they somehow think that acting annoyed or being insulting counts for something. I could argue the conservative side far far better than you and I wouldn't have to resort to a single low blow or act like it's under my skin. You, my friend, are probably bewildered at how that's even possible. I can honestly say that I'm not sure what you're talking about. Bewildered, yes, but mostly as to what it is you're trying to say. You see Mark, a statement like, "Chris Matthews and his whatever the hell you call this sort of stuff," is an insult in the place of a thoughtful point. It is possible to… forget it. If you don't get this I'm wasting my time. And don't bother commenting on my journalist point above. I should never follow commenters on BuzzMachine. Dude, your blog is lame. Not sure, again, what you're talking about. I'm not a BuzzMachine user or commenter. At any rate, since you don't want me to respond to your comment, I performed you a service and deleted it altogether. Incidentally, while I may or may not be a journalist (that's immaterial and a wholly unrelated conversation to anything you really are looking to learn), this blog is not a journalistic platform. It's my personal blog. A quick click through the archives would show that, if you had motivation beyond a lazy, half-assed desire to go around the web and insult people you disagree with. My blog may be lame, but *you* sir, are a lame person. I can fix my blog – it's doubtful you'll ever fix yourself. Wow!…wouldn’t it be mind-blowing to be a celebrity like that. So much fame and probably oodles of money, too!